FIGURE 15-9 Cellular model of the actions of aldosterone on Na+ and K+ transport processes in the mucosal cells of the collecting duct of the kidney. 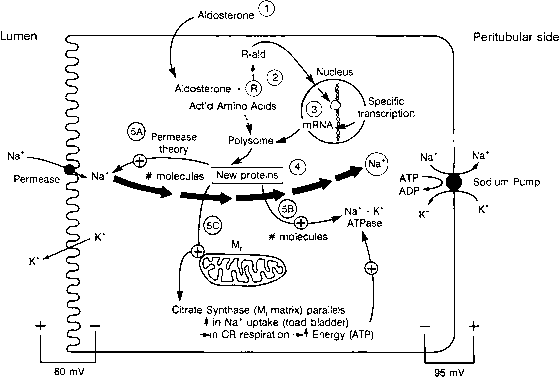 In the absence of aldosterone, there is only basal update of Na+ from the lumen by the Na+ permease and a basal rate of translocation of the Na+ across the cell so as to exit the peritubular side of the cell via the action of a Na+/K+ ATPase. The figure illustrates the five steps which are believed to be operative in the presence of aldosterone. Step (J), aldosterone enters the cell and in (2) binds to a high-affinity receptor by a reaction similar to that described for Cortisol in the liver cell (see Chapter 10). The complex of aldosterone-receptor presumably is activated and translocated to the nucleus ((3)) where it stimulates the rate of transcription of certain mRNAs which generate several aldosterone-induced proteins indicated as new proteins (@). These include the a- and /3-subunits of the Na+ permease pump (step 4A), which is believed to be the rate-limiting step in Na+ reabsorption. The Na+/K+ ATPase (step 4B) is responsible for pumping Na+ from the cell cytoplasm on the peritubular side of the cell into the peritubular fluid which increases the removal of Na+ from the cell on its way to the blood circulation and would positively influence the reactions of Na+ leading up to this step by mass action. The citrate lyase (step 4C) is postulated to increase the rate of synthesis of citrate which, after traversing the mitochondrial oxidative pathway, would give rise to correspondingly more ATP which could be available as a substrate for the Na+/K+ ATPase. Modified from O'Neill, R. G. (1990). Aldosterone regulation of Na+ and K+ transport in the cortical collecting duct. Semin. Nephrol. 10, 371. ANP receptors have been identified through recombinant DNA techniques. The atrial natriuretic peptide receptor (ANPR) A and B forms have both extracellular and intracellular domains coupled by a linear transmembrane domain; the intracellular domain has a region that is structurally homologous to a protein kinase, which functions as a regulatory element, and a second region that is a guanylylcyclase catalytic domain. The third receptor, ANPR-C, has a truncated cytoplasmic domain and, thus, is devoid of both kinase and guanylylcyclase actions. The ANPR-A shows its highest concentration in the kidney glomerulus, adrenal zona glomerulosa, brain, and cardiac aorta, which is in accord with the sites of physiological actions of ANP. The ANPR-B is found almost exclusively in tissues of neural origin, in accordance with the view that CNP acts mostly within the central nervous system. The function of the ANPR-C is not clear. It is widely distributed in the vascular system, but since the ANPR-C has no intracellular domain, it is likely that it is biologically inert. The most striking renal effect of ANF is the prompt and sustained increase in the glomerular filtration rate. Kidney (a) Increased glomerular filtration rate (GFR) leading to increased Na+ excretion and correlated reduction in plasma volume. Dilution of body fluids results from activation of the osmoreceptor and the thirst center and inactivation of the aldosterone-producing mechanism. The response of the system is a fall in the concentration of Na+, so that the original signals from the osmoreceptors and the thirst centers are quenched. Evidence supports the existence of a second system in the neurohypophysis, involving the formation of angiotensin II, a hormone that in that location could elevate cyclic AMP levels and cause additional release of vasopressin. In addition, there is new evidence of a polypeptide hormone called neurotensin found in the hypothalamus, which acts as a hypotensive agent (its action would be similar to the effect of lowering the circulating concentration of Na+). This effect frequently occurs in the presence of decreased arterial pressure and, thus, is likely mediated via selective constriction of the efferent arterioles. This leads to an increased urine volume and natriuresis. ANF also suppresses renal renin secretion, which will ultimately reduce the delivery of aldosterone to the renal tubule. This action of ANF then effectively reduces the extent of aldosterone-mediated renal tubular Na+ reabsorption, thus supporting the natriuresis process. ANF also blocks adrenal aldosterone secretion (see Figure 15-9), as well as the vasoconstrictive actions of angiotensin II. The second major biological action of ANF is its powerful relaxation of preconstricted renal vasculature and large arteries and other vascular beds. This action has been shown to result from ANF interation with the ANPR-A, which results in an increase in cyclic guanosine monophosphate (cGMP) in the vascular smooth muscle. Infusion of ANF into rats or dogs results in an immediate drop in blood pressure, which persists for the duration of the infusion. This response has also been attributed to an induced fall in cardiac output or venous return, but the mechanism of this reponse is not known.